Creative play is an important learning experience that supports all areas of child development and fosters imagination and creativity. The playground isn't the only environment for play, the classroom can also offer wonderful opportunities for creative and dramatic play that double as valuable learning experiences. 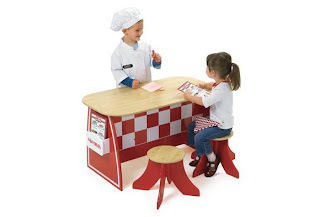 Preschool QuickSource® reminds us that "by assuming different roles, children have the opportunity to work out solutions to problems, practice new skills, and interact with others." Here's a fun activity called Local Business in the Classroom that teachs children express thoughts, ideas, and feelings in creative ways by encouraging them to independently participate in dramatic play experiences and use various materials and props to enhance their play. 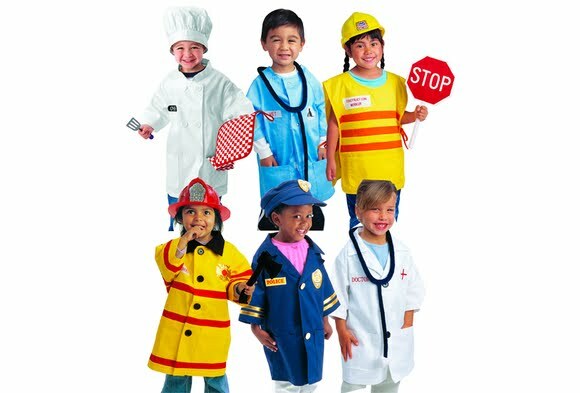 For this activity, you will need: business materials from a local business (see activity), career costumes or hats, a pretend cash register. This activity can be altered for various types of businesses or can take place without the suggested field trip (if need be). 1. Visit a local business and tell them that you would like to create a dramatic play center about that business. Ask the business for materials that would help create the center. For example, visit a local pizza parlor. Ask the pizza parlor for pizza boxes, cooking hats, signs and anything else that would be helpful in creating the center. 2. Someone from the business may be willing to visit the classroom and talk to the children about the business. If they are willing, have them share their experiences with the class. 3. Set up the center in the classroom and let the children use their imagination in creating life in the business using the materials provided. If using POCET™, this activity correlates to Developmental Guideline: CA 8 Participates in Dramatic Play by Using Materials to Create Different Roles and Situations. Other business ideas include a diner, a grocery store, a post office, or more! The possibilities are as endless as your imagination. For more developmentally-appropriate activities, visit Teacher QuickSsource® and browse through all age areas, including Preschool, Kindergarten, Infant, Toddler, and Head Start. Don't forget to explore activities promoting environmental awareness at Environmental QuickSource®, too! Activity Idea: Love Our Families!